Applications: Ideal for stainless steel and will give much better performance and life than aluminium oxide flap discs on mild steel and cast iron. 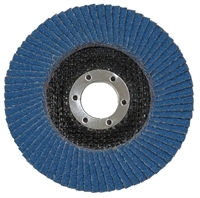 Use for grinding, shaping and weld removal on angle grinders. Product Notes: Slight conical profile for easy surface contact. Grades 40, 60 and 80 in 115mm diameter. Also Available: We also stock 100mm, 115, 125 and 180mm diameters in a range from 40 to 120 grade in our Premium Flap Disc range. Stock: Sorry, we were caught out by demand and grades 40 and 80 are currently out of stock. They are scheduled for production and will be back in stock in May.